Another movie in the franchise that is low on intelligence, but kind of cool on action, at a certain point, these movies start all being kind of the same, and that never feels as true as it does after watching this movie. Like the previous film in the series, (the one that was Paul Walker’s last entry,) this one is okay. It’s certainly better on a second viewing than it is on a first one, (just like the movie that came before it was.) That’s because on a first viewing, you can’t help but constantly be noticing how stupid the movie is. You hope for something cool, when it comes to plot, and what we are served up just gets dumber and dumber. In this movie, a villain named Cypher (played by Charlize Theron,) somehow controls Dom. Does she have something over him, or is it mind control? The answer isn’t quite as interesting as it should have been. But the action sure is cool. As usual. In this one, it involves cars falling from buildings and a crazy submarine chase. Nothing here is on the same level as a car jumping through windows of the Burj Khalifa (in the last movie,) or a fight on a gigantic airplane, (the one that came before it,) but at least we get to see Jason Statham team up with the good guys, and that’s a pretty neat twist right there. This is the weakest film since the fourth movie, but it still does have some redeemable qualities. Mainly in terms of action. 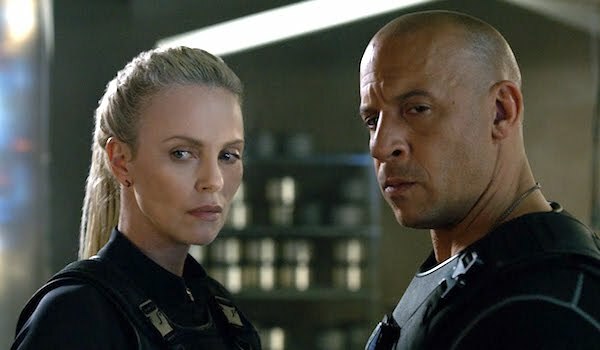 Considering that the new Fast and the Furious movie, The Fate of the Furious (movie number 8,) is the worst one in a while, (since number 4,) it would be nice to be able to say that the series has finally run out of steam. Only it hasn’t. While this movie is certainly pretty bad, one of the best things about it is the way that it brings in new characters, builds the team, (adding Ramsey, who appeared in the last movie, and now Scott Eastwood as well,) and leaves the door wide open for future films. Considering how much money the film made globally, (busting box office records apart,) this series is definitely here to stay. The movie has the very simple premise of asking the question, what if Dom went bad? Dom, of course, is Dominick Toretto, (Vin Diesel,) the star of nearly all of these movies. We’ve seen his girlfriend, Letty, (Michelle Rodriguez,) go bad. That happened in movie six, under the leadership of Owen Shaw, (a villain played by Luke Evans.) This time, its Dom’s turn. Again, it happens under the leadership of an evil mastermind. That would be Cipher, played by Charlize Theron. Last time, Letty had amnesia and forgot who she was. So she went to work for the bad guys. This time, Cipher has something that she’s holding over Dom’s head, and whatever it is, it’s enough to make him do things for her, including turn on his own team. The movie keeps the motivating factor of what exactly she has on him, close to the chest for about half its duration. This is a clever tactic, because not only is it holding onto a surprise, making us want to know the answer, but it also throws some confusion our way. Is Dom possessed? Is there some kind of mind control going on? Or does Cipher legitimately have a reason why Dom would knowingly be working for her? Until we are get the answer, we remain immensely curious. Unfortunately the reveal isn’t all that great. But that’s okay, because this movie isn’t just about Dom. In fact, he is just one of many, many characters of importance on this team, (a fact which has never been more clear and apparent than it is in this movie.) Dom isn’t really needed, and this film has no problem pointing that out. I say this knowing full well that the plan for the next film (as of now,) is to leave Dom out and give us a teamup movie featuring Jason Statham and Thr Rock. The Fast and Furious movies have always been about a brotherhood teamup of two guys. It claims to be about “family,” but if you really look at it, this series is about brotherhood or partnership. Most of the time, it’s been Vin Diesel and Paul Walker. In the second movie, it was Paul Walker and Tyrese Gibson. But now Walker, the actor, has passed away, and a new brotherhood is formed in this film. This time it’s The Rock and Jason Statham. Thats the other big twist or plot point of the movie. Plot point one is that Dom goes bad. Plot point two is that Deckard Shaw, (Statham,) goes good. And why not? In the fifth movie, (the best of the series,) The Rock was the villain, of sorts. And they successfully flipped that on its head and brought him onto the team for the next film. So why not try Statham? Maybe because he killed their friend, Han, in cold blood, in a past movie. Everyone here seems to have forgotten about that little fact. But from a marketing point of view, its genius. Statham is the king of B movies, so making him a regular here, in a series that has always been B movie quality, is terrific. Its also about the only thing this movie has going for it, plot wise. The evil Dom stuff and the good Deckard Shaw stuff. Not that these movies were ever really about plot. The original film, for example, simply took the movie Point Break and set it in the world of cars instead of the world of surfing and skydiving. The Fast and the Furious movies have always been about action, and unfortunately that’s another area where this film is lacking. The last two movies took action to a new level. First there was the tank on the highway scene, and then we got a car jumping from building to building inside and out of the Burge Khalifa of Du Bai (the tallest building in the world.) Here, we get a lousy submarine that is all CG effects, and it is more careless and fake looking than entertaining. But before that lousy ending, there’s a little bit of fun to be had. The opening action scene, where Dom drag races a car while it’s on fire, is both totally ridiculous and also kind of cool. To be clear, it’s dumb as hell. Dom knows the car is about to explode any second, and yet he stays in it, because winning the race is apparently more important than his face (clearly it would have been burned with the fire coming through the windshield,) and his life. But as dumb as the scene is, it looks damn cool. The bright red engine with no covering in the super old and beat up car, makes the race pretty funny and enjoyable. Unfortunately, it’s the first action scene in the whole movie and quite possibly the best. The fact that the Rock’s character, Hobbs, goes to prison, seems forced. We saw it in the trailer, but it really looked like the prison move was s fake justvto frt him close enough to Deckard Shaw. Turns out it’s real. And dumb as that is, the good news is that it leads to a pretty cool prison riot action scene, with characters jumping off the walls. 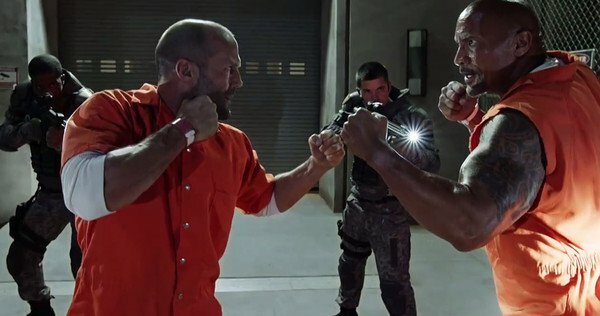 It would have been nice to see Hobbs and Shaw trade a few punches. The last movie gave us that opportunity, but this one just teases it. And by the end of the scene, Mr Nobody (Kurt Russell,) and his assistant (Scott Speedman, most likely the newest member to the team,) are busting Hobbs and Shaw out and giving them a new mission. We jump back and forth now between the story of Dom, on Ciphers plane, and that of the team. There’s plenty of humor rim the Tyrese – Ludacris duo, just like always, and this time it’s slightly more funny than usual (with Tyrese not making it onto the list of the top ten most wanted criminals, with his friends.) We get the reveal about what’s controlling Dom, and then almost immediately afterwards, we get another mystety. The Helen Mirren character. Who is she, and what is she all about? Dom goes to meet her, but all that does is raise a bunch of questions and make us curious for the answers. The film builds to its big submarine climax, but the highlight during this portion of the movie is not the submarine scene. It’s Deckard Shaw on a plane with a baby. That’s right. Unbelievable as it is, Jason Statham steals the movie in the final scenes, proving that comedic action is more fun than big budget ridiculous computer effects action. If Statham and the Rock are the next incarnation of this series, then I’m on board, because the two of them are definitely the highlights of this film. They’re the ones who have real personality. The action and plot are worse than usual with this film, but the comedy and characters are a little better, so in the end, it all evens out. This series has definitely gotten worse, but if the move rim film 4 to film 5 taught us anything, it’s that it only takes one movie to turn all that around.